By using an ancient method of rainwater harvesting, Rajendra Singh is bringing about massive change to drought-stricken areas of India. 30 years ago, Singh visited Rajasthan—one of the most poverty-striken regions in the country—with the hope of establishing some health clinics there. Upon his arrival, the villagers made it known that water was of far greater urgency, as their wells had dried up, and their crops were dying. So, Singh taught the people there how to build johads, which are traditional earthen dams that can catch the annual monsoon rains. Since his arrival, over 8,500 dams have been built, and they now collect water for over a thousand villages in Rajasthan. Last week, Singh received the 2015 Stockholm Water Prize, which is also referred to as “the Nobel Prize for water”, in honor of the incredible work he has done. Thanks to Singh’s efforts, groundwater has been replenished across the state and forests have begun to recover. With their return, animals that haven’t been seen in the area for years, including antelopes and peacocks, are being seen drinking from the rivers and grazing among the trees. These previously drought-stricken regions are now bustling with agriculture, and instead of having to walk for several miles to carry drinking water back home, village women can create handicrafts. Singh has literally changed the lives of thousands of people, and is revered for his efforts. Singh realizes that climate change will be influencing both the frequency and intensity of floods and drought around the world, but hopefully the work he has done in India can be of help to those in other countries who are experiencing similar issues. Please visit Singh’s NGO, Tarun Bharat Sangh, for more information. 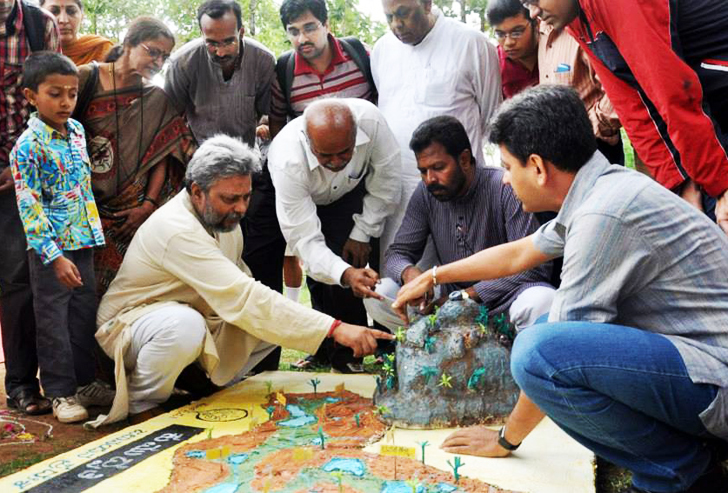 By using an ancient method of rainwater harvesting, Rajendra Singh is bringing about massive change to drought-stricken areas of India. 30 years ago, Singh visited Rajasthan—one of the most poverty-striken regions in the country—with the hope of establishing some health clinics there. Upon his arrival, the villagers made it known that water was of far greater urgency, as their wells had dried up, and their crops were dying. So, Singh taught the people there how to build johads, which are traditional earthen dams that can catch the annual monsoon rains. Since his arrival, over 8,500 dams have been built, and they now collect water for over a thousand villages in Rajasthan. Last week, Singh received the 2015 Stockholm Water Prize, which is also referred to as "the Nobel Prize for water", in honor of the incredible work he has done.